Some of the more fun things I’ve been doing amidst this rain filled time I have been in VA is playing with flowers for my upcoming best friend’s wedding and making origami butterflies. The flowers are dying (I waited too long to take the pics! ), and they are just some of what my friend wants to use. I just bought the basics and some fill ins so she could have an idea of what things will potentially look like. I just love flowers and these were so pretty! In case you like any of them, they are hydrangeas, calla lily’s, spray roses, tulips, and some other stuff I forget what it’s called. 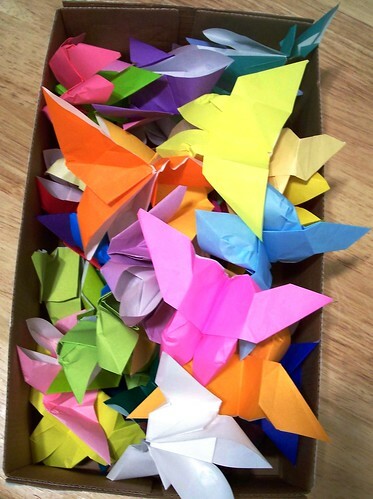 This is a box full of origami butterflies that I am going to use at one of the future bridal showers. The colors just brought a little color to my day today. I used this tutorial. I’m playing around with some new patterns. I am hard at work making things for my etsy shops and for a craft show that I’m going to participate in this fall. I love bright and happy fabric!!! So did you decide if you’re doing the Craft Mafia show? Let me know if you need an extra hand. I <3 crafts.